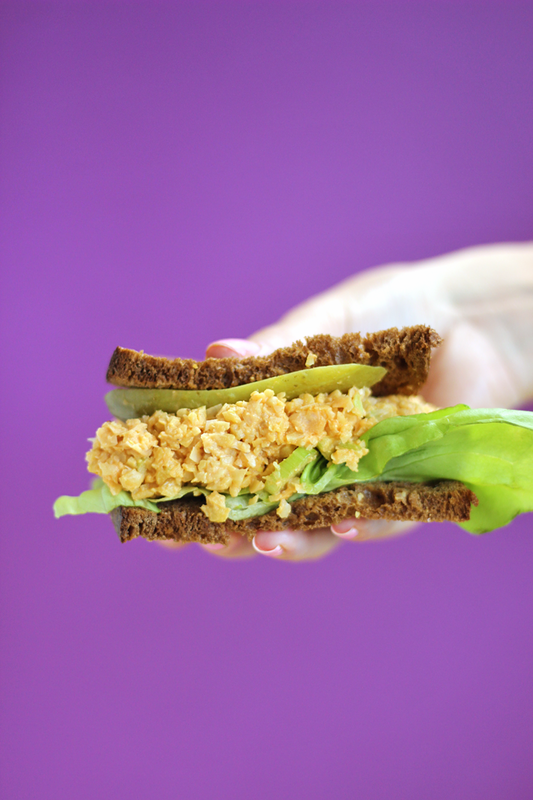 This Buffalo Chickpea Salad Sandwich is packed with fiber, plant based protein and finished off with a hot spicy kick. It’s guaranteed to become your next brown bag lunch staple. Even though I’m not vegan, I love experimenting with plant based recipes. 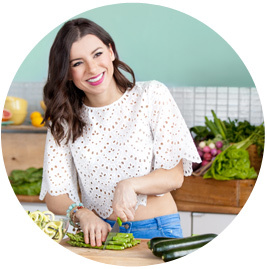 I encourage people to eat more plants as part of a healthy balanced lifestyle; but I also love plant based recipes because you can create something healthy and delicious, even when you’re running low on certain ingredients. This traditional Buffalo Chicken Salad has all the same flavours you’re used to, but with a fun twist – you won’t even notice it’s not made with meat! 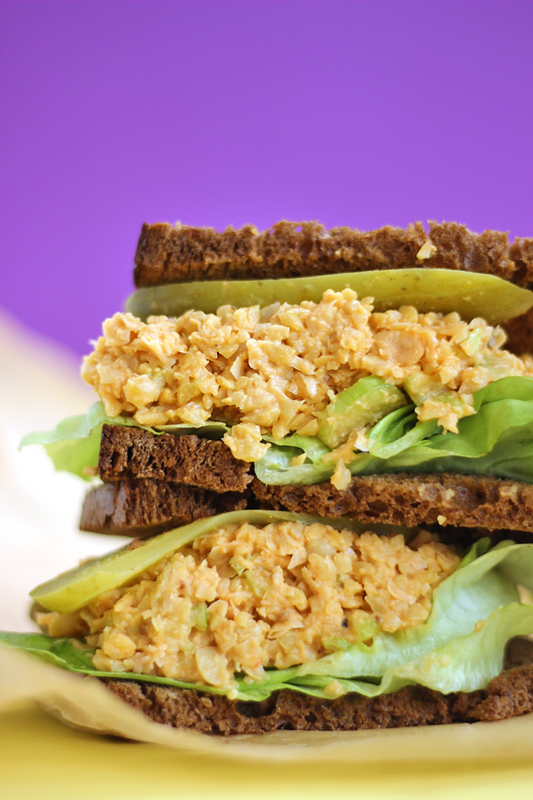 This Buffalo Chickpea Salad Sandwich is the next egg or tuna salad sandwich substitute, healthified. 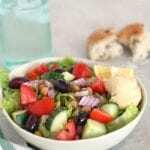 It’s satisfying and flavourful with a spicy kick, and it’s packed with a daily dose of fiber! Add this salad onto some toasted pumpernickel bread with a few leaves of lettuce and sliced dill pickles; you’ll have yourself a homemade lunch that you’ll actually look forward to when 12 O’clock rolls around. It’s the perfect back to school lunch that people will be begging to try. 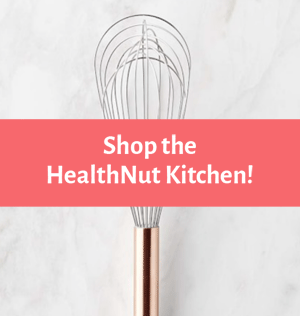 If you recreate this recipe be sure to send me a photo using the hashtag #HEALTHNUTEATS on social media so I can easily find and like your photo!! I love seeing your HealthNut recreations ???? 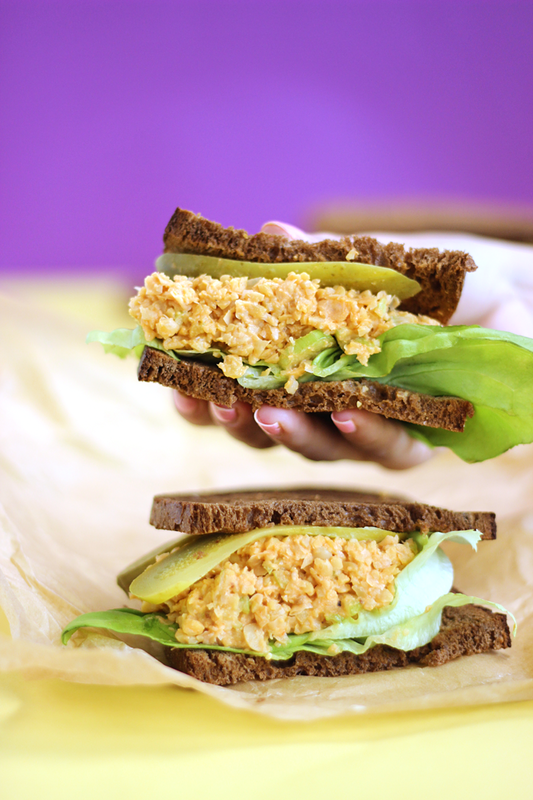 A Buffalo Chickpea Salad Sandwich packed with fiber, plant based protein and a hot spicy kick. 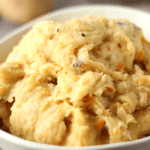 In a food processor, add in chickpeas, mayo, hot sauce, salt and pepper and process for 5-10 sec - just until the chickpeas are slightly mashed. Don’t over process or you’ll end up with a spicy hummus… which is also delish, but a snack for another day! Toss in the celery and process for another couple of seconds just until the celery is combined but still chunky. 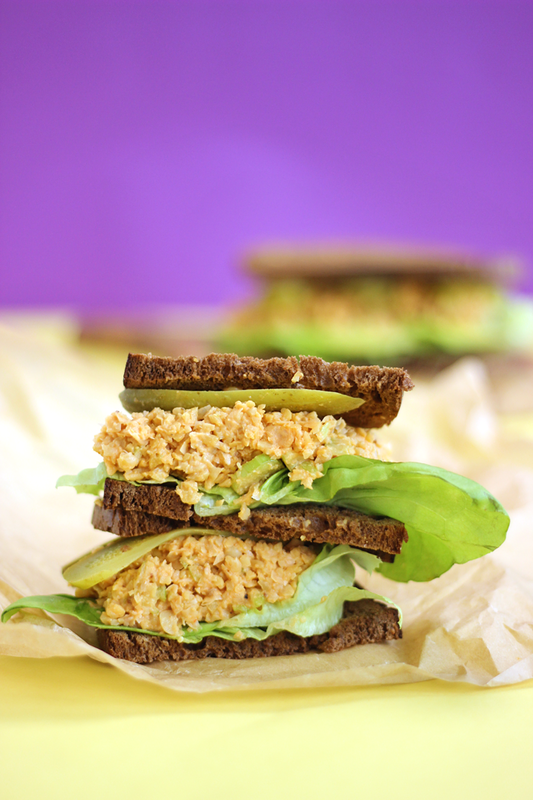 On toasted or untoasted sliced pumpernickel bread, layer on your lettuce, 2 scoops of the buffalo chickpea salad and pickles. Slice in half and wrap in parchment paper for a delicious, healthy lunch. Notes: You can store any leftover buffalo chickpea salad in an airtight container in the fridge for 5 days. YES YES YES! I’ve been trying a plant-based diet for a few months or so and I feel amazing! 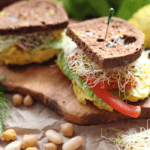 I love this sandwich idea–the chickpeas look phenomenal. And this is coming from someone who doesn’t eat sandwiches! Just made this and it is OUT OF THIS WORLD!!! 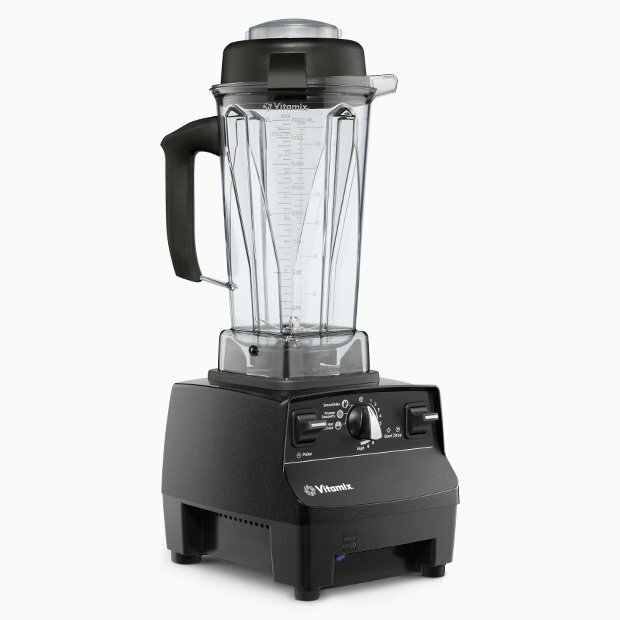 Can not wait for the rest of the family to give it a try. East to make and so full of flavor. This looks delicious! 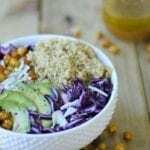 I love seeing recipes that help people add more pulses to their diets! Okay, YUM. I am really picky on spicy things, so I did more mayo and less hot sauce, but paired with lettuce and pickles, this was out of this world!! I definitely will be making this a quick staple in my lunch routine. Thank you so much for this!